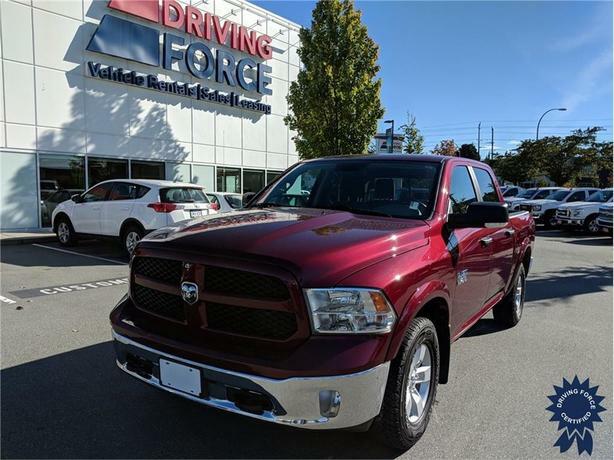 This 2017 Ram Outdoorsman Crew Cab 6 Passenger 4X4 5.5-Foot Short Box comes with a 140.5-inch wheelbase, 8-speed TorqueFlite automatic transmission, 3.55 rear axle ratio, 17-inch wheels, red pearl exterior color, spray-in bedliners, Uconnect 3C with 8.4-inch display, ParkView rear backup camera, transfer case skid plate, front suspension skid plate, tow hooks, block heater, 160-amp alternator, towing with harness and trailer sway control, Class IV hitch receiver, auto locking hubs, deep tinted glass, remote keyless entry, cruise control with steering wheel controls, manual air-conditioning, two 12V DC power outlets, remote USB port (for charging only), remote engine starter system, 121-litre fuel tank, 1,630 lbs Maximum Payload, and GVWR rating of 6,800 lbs (3,084 kgs). The 3.6-litre Pentastar V6 gas engine provides 305 horsepower at 6,400 RPM and 269 lb-ft of torque at 4,175 RPM. Touch base with us to discuss purchasing or financing options that are right for you and experience the difference you will only find at DRIVING FORCE Vehicle Rentals, Sales and Leasing.